What the heck is a "ribbon taggy"? 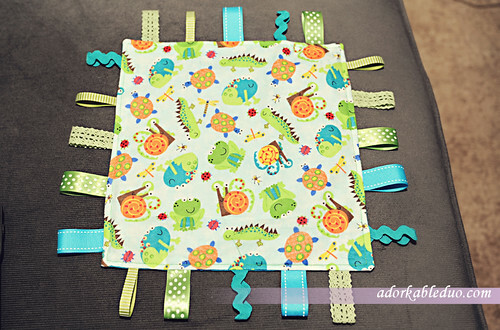 It’s just a blanket, or small section of a blanket that is sewn with ribbon "tags" coming out of the edges. 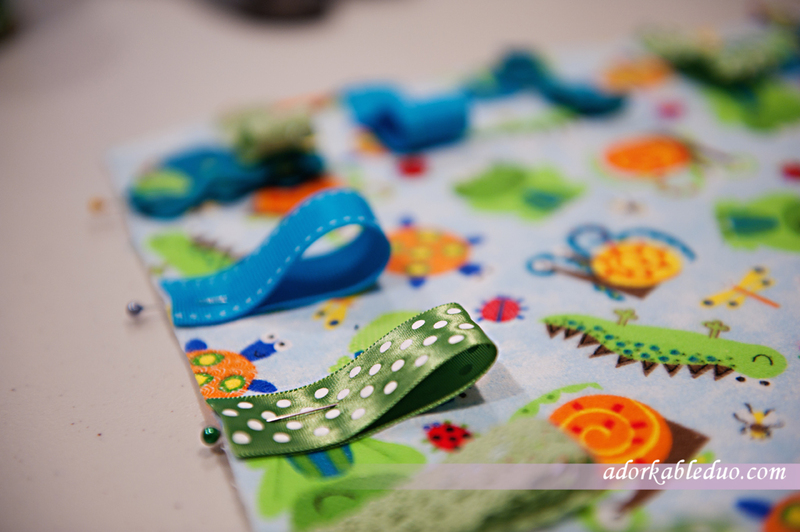 Babies love the different colors and textures, so it’s nice to make these with minky, satin, fleece, etc. materials to stimulate touch. 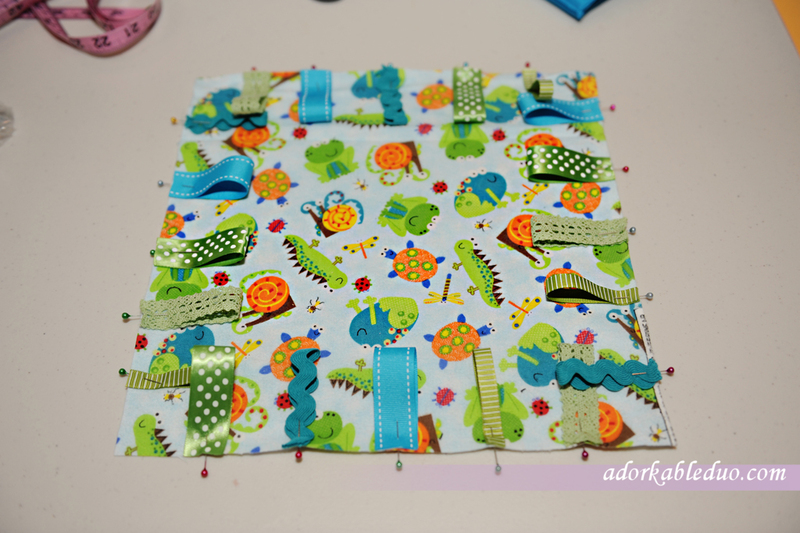 I made a pretty simple square one with fleece and satin. First, I took my paper ‘template’ (yes, I am lazy and didn’t bother making it any different than a page of scrapbook paper that I had lying around) and cut out my fleece and satin in to size. Cut the ribbon approximately 5" in length. 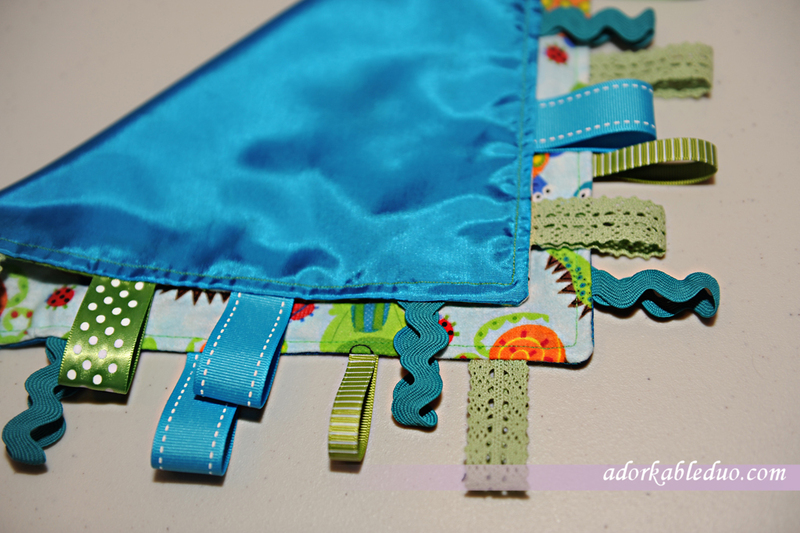 Depending on how many ribbon tags you want on each side, you might have more or less than what I chose to do. I put 5 per side with the 12" x 12" pieces. Grab one of the fabric pieces and put it face up on your worksurface. Grab one ribbon and fold it in half. Then pin it perpendicular to the edge. 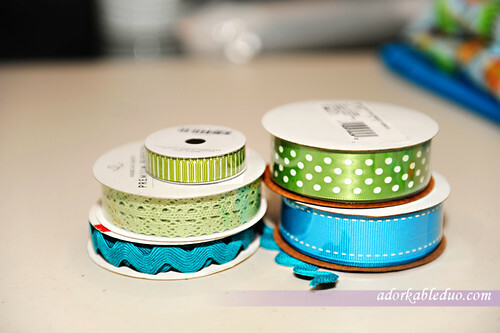 Repeat this step with all of your ribbon. 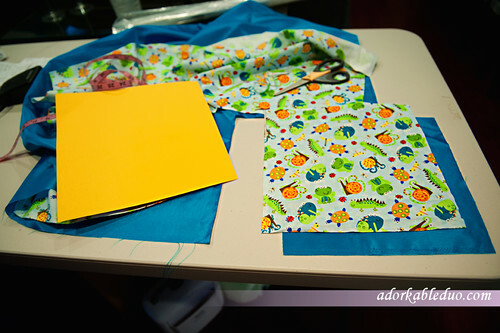 Grab the last piece of fabric and pin it directly on top of what you just did – be sure to put it face down. Yes, your ribbon will be captured on the inside. 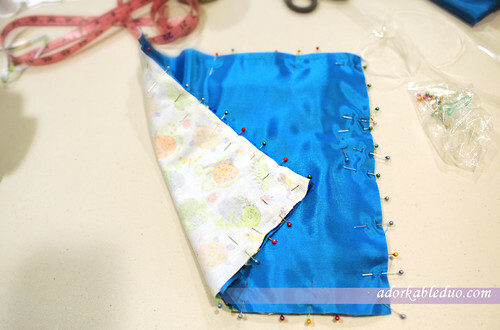 Now, head to the sewing machine and sewing about 3/8" from the edge all the way around – leaving an opening on one side that is big enough for you to turn the blankie inside out. 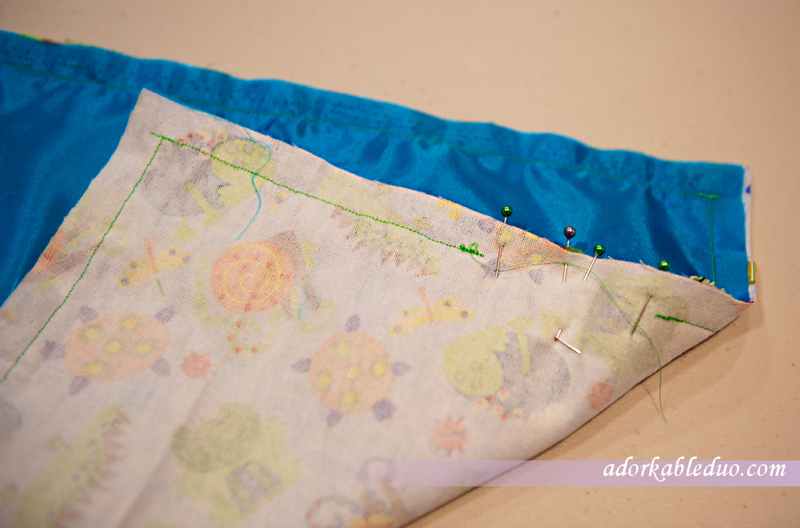 Remember to reinforce the beginning and ending stitch with some backward and forward sewing. Turn that baby inside out! Sew the open hole shut. I hand stitched mine closed. Here it is with the pin that held it together while I started to hand-sew it closed. 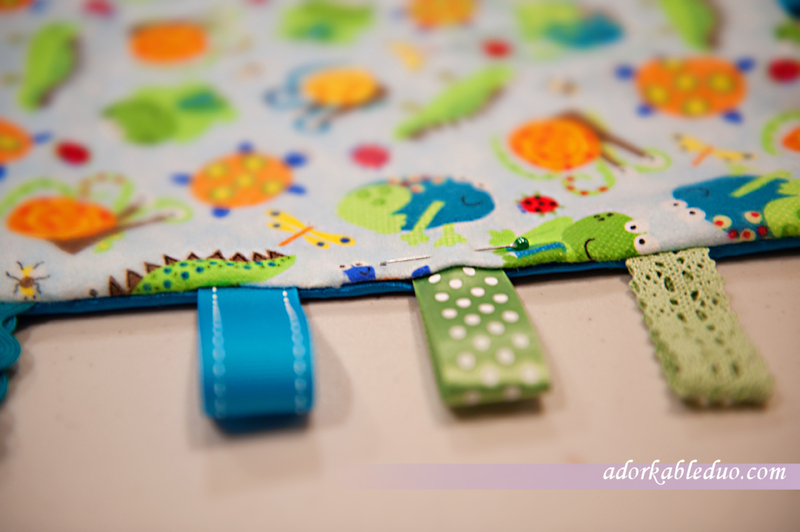 Then, head back to the sewing machine to finish the perimeter and ensure that the tags stay intact if baby gets agressive playing with it. 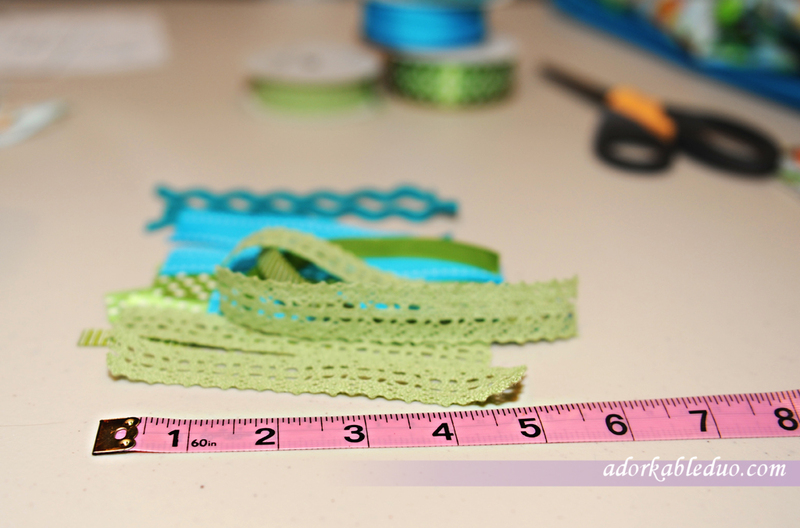 I sewed about 1/4" in from the edge. Here you go – baby’s very own ribbon taggy made by mom (or dad)!